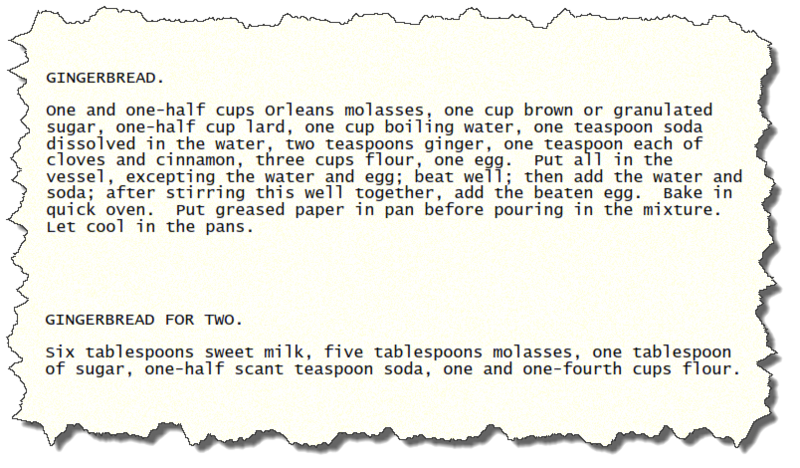 One and one-half cups Orleans molasses, one cup brown or granulated sugar, one-half cup lard, one cup boiling water, one teaspoon soda dissolved in the water, two teaspoons ginger, one teaspoon each of cloves and cinnamon, three cups flour, one egg. Put all in the vessel, excepting the water and egg; beat well; then add the water and soda; after stirring this well together, add the beaten egg. Bake in quick oven. Put greased paper in pan before pouring in the mixture. Let cool in the pans. Six tablespoons sweet milk, five tablespoons molasses, one tablespoon of sugar, one-half scant teaspoon soda, one and one-fourth cups flour.